Green Bag Lady: Fun Fall Freebie! How about a some fun this fall? We have some really great fall theme fabric bags that we would like to send out! 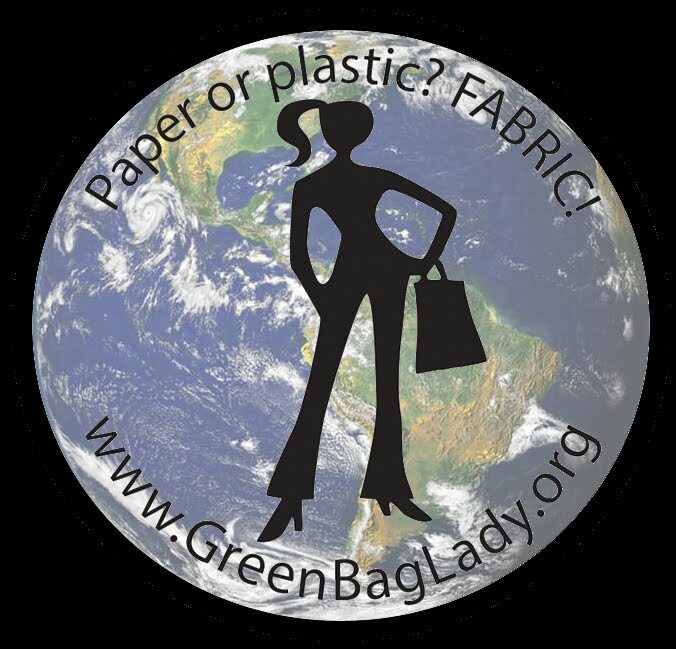 Will you help us encourage more people the use fabric bags? We will reward you for it! •LEAVE A COMMENT, IN THE COMMENT LEAVE YOUR EMAIL ADDRESS IN THIS FORMAT: name(at)something(dot)com it is important to spell out dot and at so you don't get spam, if you DO NOT leave an email address, we will not hunt you down to send you a freebie, thanks. Also, we have TWO stainless steel composters for TWO of you who help us recruit NEW (they must be people who don't already have a bag from us) Green Bag Lady baggers. •Leave a comment with your name (can be a nickname) and your email address and tell us you are entering the composter freebie. •Do a blog post/email/facebook/twitter, etc. and tell everyone to come and enter this freebie for a bag. Make sure they tell us you sent them in their comment. And, they all use the SAME name for you! •The TWO people with the most referrals will get one of these fabulous composters to make your kitchen über green! Deadline is also midnight (CST) Wednesday, Sept 29, 2010. THIS FREEBIE IS CLOSED, THANK YOU FOR ENTERING. SHANNON WON THE COMPOSTER, ALL THE OTHER ENTRIES WILL GET BAGS! CHECK YOUR SPAM FOLDER IF YOU DON'T SEE AN EMAIL FROM MY FATHER, BAGETTE DAD. THANKS. I love your bags. I would love to win one. I only use these kind of bags. Great work also. I would love to have one of your bags. I would love to try one of your bags. I have been using cloth bags for a while now and they work great. We are proud of you here in Minnesota T - keep up the great work! That's cool! Your work is commendable. Not many shops proposing their clients to purchase shopping bag which is can use it over and over. The idea of making our own shopping bag is great one. Thank you for sharing the idea. i simply love your bags. i have personally stopped using plastic bags from the past two and a half years. while looking for a video to help me stitch a cloth bag for myself, i came across your video on youtube. in spite of being a novice in stitching, i managed to stitch many bags and also gave few to my friends to encourage them to stop using plastic bags. the photos of the bags posted on you website recently are faboulous. I would love one of your bags! I'm also going to make some using the pattern on your site. I would like to enter for one of the composters! I am going to post a link to your freebie right now on Facebook. Thanks! I'd love one of your bags!! I'd love one of your bags! Shannon referred me! I love reuseable shopping bags, We use them all of the time and would love to tote one of your around with us!! Oh by the way Shannon M reffered me!!! these are great. I would love one. Shannon sent me! I would love one of your bags. I would love a bag because I love this site!!! Shannon sent me the link. These bags are great! Thanks Shannon for letting me know about this! What a wonderful idea. Your bags are works of art....never thought of making one myself. I got here through the San-Man forum. I was looking for members in PA and saw that you were in Lancaster....I live in York. Your bags are awesome! Brittney Connor posted about them (I am pretty sure she has many times). Keep making the world better. Thanks to your beautiful volunteers, I found out about this site working at a grocery store, using plastic bag after plastic bag. I would love to help spread the fabric! I found out about this site from one of your volunteers and would LOVE one of your pretty bags! Just found your wonderful site via Harmony's Art Blog: The Journey is the Prize and I'd love to win one of your bags and I'm off now to post about it and hopefully get some referrals for the composters. Salutations and thank you for contributing to the eradication of plastic bags. I would like one your lovely fabric bags, please. My e-mail is oceanmythos@yahoo.com. I would love one of your free bags :] this seems like an amazing way to change things! I would love to try one of your bags, I have been trying to use cloth and paper bags all the time but it'd be brilliant to have a spare one to carry around if I do a bit of sneaky shopping! I would really like one of your bags and will spread the word about your great site! I LOVE your bags. I check your blog every day. I would be honored to have one of your bags. Thanks so much!! I like Your bags!!! !It's cool!!! I'd like to have it!!!!!!!!!! Just found your site & it has just the things that Mo-Ranch was looking for to stress the importance of ecologically sound practices, conservation, recycling and education. Thanks for what you do! AND thanks for letting us reproduce your pattern in our newsletter! Hi Cute bags! I would love to have one. Shannon M sent me ( Mrs Munchy) I hope she wins the composter! Your bags are beautiful! It makes not using plastic fashionable AND functional! I found out about your bags from a local blog that my family reads daily. I sure hope I can get one of your bags would be a proud owner. Green Bag Lady the most wonderful and colorful bags. I really liked them! Send 1 please.Thank you.